I like that too, especially when the previous reader’s notes are thoughtful and engaging. There’s even something mysterious about it; I suddenly want to know more about that reader and like trying to imagine how they might have said those notes out loud (sarcastically, angrily, etc.). It’s pretty amusing, though, when you get notes that are not even coherent. Comments can tell just as much as the actual text can, I think! 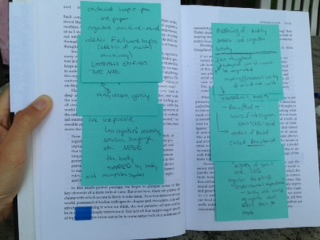 I’m a little tempted to start leaving more stickies in the books I borrow, just because I like finding them so much.